Demand for increased weight capacity and the need for larger payloads results in four new lift models that increase material handling efficiency. Waukesha, WI – April 2018, Wildeck, Inc. – In response to customer demand for increased weight capacity and the need to move larger loads, Wildeck, Inc. has introduced (4) new rideable material lifts (RML). 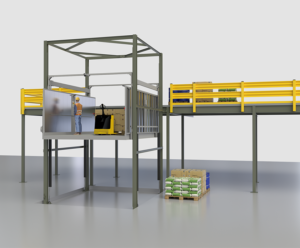 The new “RML” product category is a major advancement over a traditional “VRC” (Vertical Reciprocating Conveyor) since it allows authorized personnel to safely travel with materials instead of climbing stairs to catch up with the load. Wildeck is announcing its expanded “RiderLift™ Family” of hydraulically-operated rideable material lifts at Wildeck’s Booth # B4747a at the Modex 2018 Show, April 9-12, at the GWCC (Georgia World Congress Center) in Atlanta, GA.
RiderLift™ material lifts meet all applicable code and safety requirements and are available in either “C” or “Z” loading patterns. They feature a keyed “enable” switch inside the car to ensure use only by authorized personnel. Although they are not a public elevator, a licensed Elevator Contractor must install and service the lift and provide the end user with ongoing State-approved safety inspections and lift Certification, as required by the A17.1 code. Wildeck, Inc. – based in Waukesha, WI – is a member of MHI (Material Handling Industry Association), MHEDA (Material Handling Equipment Distributors Association), the NAEC (National Association of Elevator Contractors), and FMA (Fabricators & Manufacturers Association, International). The company is the largest manufacturer of manual and automated vertical lifts (VRCs), rideable material lifts (RMLs), structural steel mezzanine platforms, and safety guarding products in North America. A complete line of industrial rolling ladders, custom-designed work platforms, crossovers, and other high access products are also available. Wildeck products improve supply chain productivity and provide additional capacity, efficiency and safety in manufacturing plants, warehouses, distribution centers, and many other facilities. They are sold through a dedicated and experienced network of customer-service-oriented dealers and systems integrators nationwide. Wildeck, Inc. is a subsidiary of Holden Industries, a 100% Employee-Owned Company. Please contact Hue Schlegel, Director of Marketing at 262-549-4000, ext. 2049, hschlegel@wildeck.com for more information on the complete line of Wildeck® products and services; or visit www.wildeck.com, or e-mail info@wildeck.com. The RiderLift™ 4XL (shown here with one rider and palleted material on a heavy-duty electric pallet truck) is the largest of four new rideable material lifts introduced by Wildeck. It can transfer loads up to 10,000 lbs. between levels on a large 12 ft. x 20 ft. car. Note: Required gates and enclosure panels are not shown for clarity. All RiderLift™ models comply with the ASME A17.1 / CSA B44 “Safety Code for Elevators and Escalators,” and allow authorized personnel to ride the lift between levels with their material.